An Seminte, tsaa o tsa amo an irimnom nga tikang ha dahon, danay tikang ha iba nga parte han tanom, nga pinakaladkad o ginhalo ha mapaso nga tubig. ↑ Abuyen, Tomas A. Diksyunaryo Waray-Waray [Visaya] English-Tagalog. Kalayaan Press Mktg. Ent., Inc. Quezon City. Tuig 2000. ISBN 971-08-6050-X. Pakli Ihap 334. ↑ Abuyen, Tomas A. Diksyunaryo Waray-Waray [Visaya] English-Tagalog. Kalayaan Press Mktg. Ent., Inc. Quezon City. Tuig 2000. ISBN 971-08-6050-X. Pakli Ihap 392. Mair, Victor H.; Hoh, Erling (2009). The True History of Tea. Thames & Hudson. ISBN 978-0-500-25146-1. http://books.google.com/books?id=_TR_PQAACAAJ. Martin, Laura C. (2007). Tea: The Drink that Changed the World. Tuttle Publishing. ISBN 0804837244. http://books.google.com/books?id=DJ2j_bX6WTUC&pg=PA8#v=onepage&q&f=false. 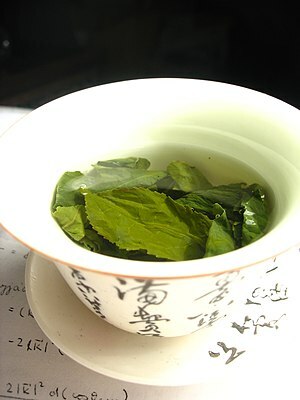 Claud Bald: Indian Tea. A Textbook on the Culture and Manufacture of Tea. Fifth Edition. Thoroughly Revised and Partly Rewritten by C. J. Harrison. Thacker, Spink & Co., Calcutta 1940 (first edition, 1933). Kit Chow, Ione Kramer (1990): All the Tea in China, China Books & Periodicals Inc. ISBN 0-8351-2194-1. Jason Goodwin (1990). "The Gunpowder Gardens: Travels through India and China in Search of Tea." Re-issued on Kindle 2012 ASIN: B007YANR90; first published by Chatto & Windus (London) 1990; Knopf (New York) 1990; reissued by Penguin (2003). Harler, C. R., The Culture and Marketing of Tea. Second edition. Oxford University Press, New York and Bombay, Reprinted 1958 (First edition 1933, second edition 1956). Eelco Hesse (1982), Tea: The eyelids of Bodhidharma, Prism Press. Hobhouse, Henry (2005). Seeds of Change: Six Plants that Transformed Mankind. Shoemaker & Hoard. ISBN 1-59376-049-3. Karmakar, Rahul (13 April 2008). "The Singpho: The cup that jeers". Hindustan Times (New Delhi): p. 12. http://www.hindustantimes.com/News-Feed/india/The-cup-that-jeers/Article1-304178.aspx..
Kiple, Kenneth F.; Ornelas, Kriemhild Coneè, eds. (2000). The Cambridge World History of Food. 1. Cambridge: Cambridge University Press. ISBN 0-521-40216-6..
Lu Yu (陆羽): Cha Jing (茶经) Translated and Introduced by Francis Ross. The Classic of Tea. Boston: Little, 1974. x, 177p. ISBN 0-316-53450-1; Reprinted: Ecco Press, 1997. ISBN 0880014164. Roy Moxham (2003), Tea: Addiction, Exploitation, and Empire. Nye, Gideon (1850). Tea: and the tea trade Parts first and second. New York: Printed by G. W. Wood. http://www.worldcat.org/title/tea-and-the-tea-trade-parts-first-and-second/oclc/262465848?title=&detail=&page=frame&url=http%3A%2F%2Fwww.archive.org%2Fdetails%2Fteateatradeparts00nyegrich%26checksum%3Db45d19e461244b1ecae4c6e265b02b66&linktype=digitalObject. Lester Packer; Choon Nam Ong; Barry Halliwell (2004): Herbal and Traditional Medicine: Molecular Aspects of Health, CRC Press, ISBN 0-8247-5436-0. Jane Pettigrew (1999), Tea & Infusions: a connoisseur's guide. Carlton Books. Pettigrew, Jane & Richardson, Bruce (2005). The New Tea Companion: a guide to teas throughout the world. Benjamin Press. ISBN 0-9663478-3-8. Tunstall-Pedoe, M.; Tunstall-Pedoe, H. (1999). "Coffee and tea consumption in the Scottish Heart Health Study follow up: conflicting relations with coronary risk factors, coronary disease, and all cause mortality". Journal of epidemiology and community health 53 (8): 481–487. PMC 1756940. PMID 10562866. doi:10.1136/jech.53.8.481. Yang CS, CS (November–December 1999). "Tea and Health". Nutrition (Burbank, Los Angeles County, Calif.) 15 (11–12): 946–949. PMID 10575676. doi:10.1016/S0899-9007(99)00190-2. Ini nga pakli kataposan nga ginliwat dida han 06:28, 23 Enero 2015.